When preparing your home for sale, in addition to de-cluttering, painting the walls, and sprucing up the landscaping, it’s also important to look at the condition of your flooring. Most of us grew up in homes with lots of plush carpeting. Cozy looking and soft to walk on, carpet is still an extremely popular choice in residential spaces. There are however, a few downsides to carpeting, including the fact that they emit chemicals like formaldehyde into the air. They also get stained and dingy looking fairly quickly, and become mildewed and musty-smelling if liquids come in contact with it. Because they absorb things like smells and moisture, carpets that aren’t cleaned regularly can really make a room appear lackluster. Even when buyers are purchasing a resale home, they want to think that the house they’re buying is brand new. They don’t want to step on rug that another person’s been tracking dirt all over or dropping food on. This is part of the appeal of smooth flooring options like hardwood or laminate. Spills can be cleaned up quickly and effectively, and chemicals from things like synthetic fibers, padding, and carpet backing are a non-issue. Style is also a factor, with hardwood or laminate flooring options appealing to more buyers than carpet. Hard flooring options tend to be more flexible than carpet, and look great with a variety of furniture styles and color schemes. They can also be covered with area rugs wherever necessary. Over the past ten years, laminate flooring has become one of the most popular options for homeowners. Inexpensive, low maintenance and extremely durable, laminate flooring is a great alternative to stone or hardwood floors. Laminate flooring is built out of melamine resin and can be designed to resemble natural wood grain, stone, marble, or granite. It can make a room appear larger and more modern, holds up extremely well in high traffic areas, and is very easy to install. Bamboo flooring has also garnered a lot of attention in recent years. Bamboo is a great hard flooring material for homeowners who are looking for environmentally conscious materials. 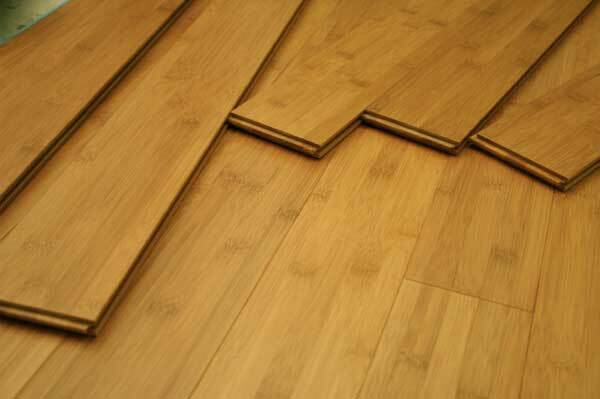 Bamboo floor materials come from Moso bamboo stalks, which grow back very quickly. The fact that the plants themselves don’t have to be destroyed in the harvesting process is part of the reason that these types of floors are considered eco-friendly. Bamboo is also very strong, insect resistant, and attractive. It can mimic the natural grain patterns of hardwood, or you can choose to buy classic bamboo style with its characteristic “knuckles”. Like bamboo, cork is another environmentally friendly flooring material that has become quite popular with homeowners. Cork grows as bark on the Cork Oak tree, and can be harvested every 10 years or so. Cork can be taken without harming the tree, and the bark eventually grows back, making this type of flooring very earth-friendly. In addition to being produced from a natural resource, are also very practical. Cork is fire and water-resistant, retains heat and reduces noise. is also affordable, and available in a variety of stains and designs. Ceramic tile is a popular sight in and bathrooms, as it is water-resistant and affordable. Ceramic can be a little chilly underfoot, and becomes quite slippery when wet, but buyers can find slip-resistant styles and install in-floor heating. Hardwood has long been a classic choice for flooring, though its cost can be prohibitive. Hardwood also requires more maintenance than laminate, and has greater impact on the environment than bamboo or cork. When choosing a flooring material, take into consideration the size of the room, the costs of the materials, and their ease of care. Make sure you don’t install something that will require a lot of scrubbing or refinishing to keep looking nice. You want your home to put its best foot forward-without breaking the bank.